NDN, FIRST NATIONS, ABORIGINAL, INDIAN, NATIVE ??? I've been told Indians come from India and that the dudes in tipis and sweat lodges are Native Americans, Aboriginal, Native Canadians or First Nations people, yet you use the word ‘ndn’ in your comics. Is this all just political correctness going mad? - Christina C.
It all depends on who you're talking to, all terms are acceptable (except maybe Redskin, its one of those words you only say if you are one). 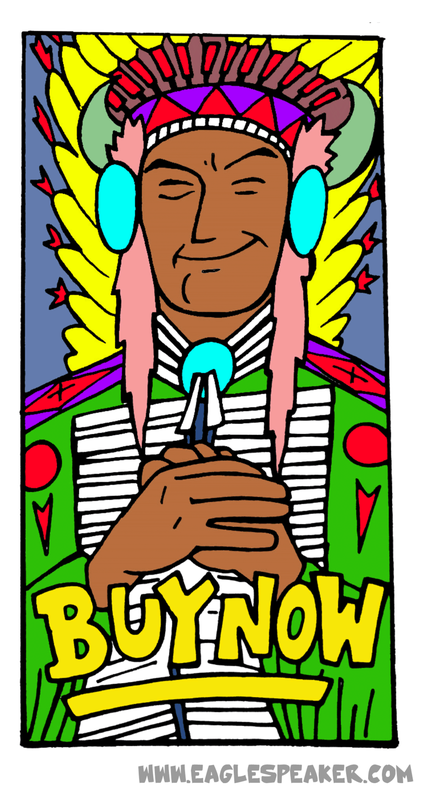 Look at it this way - Native people, like anyone, prefer to be called by their actual name. North American Indian people (Canada & USA) should be best understood as literally thousands of communities and cultures - there is no one-size fits all. As you learn more about us, you learn that each community has distinct languages, religious beliefs, ceremonies, challenges, social & political systems etc. Choosing just one of the above words says very little about the diversity, independence and uniqueness of our cultures. Just like other cultures around the world, our diversity is obvious ... when you look a little closer. Just as an Irish person wouldn't like to be referred to as Scottish, so are the differences among Native people. Personally, I am half Blackfoot and half Duwamish. I would prefer if you asked me about which tribe(s) I am from, rather than just label me with one name. WHAT EXACTLY DOES GRASSROOTS MEAN? I hear the word "grassroots" used quite loosely within many Aboriginal organizations. What exactly does grassroots mean to you? - Nelson J.
Yeah ... I hear (and use) that word quite often myself. Literally, the word grassroots implies that the creation of a social movement and the group supporting it is natural and spontaneous - as opposed to something that is orchestrated by traditional power structures. It's source may come from a phrase spoken back in 1912: "This party has come from the grass roots. It has grown from the soil of people's hard necessities." I will be the first to admit that this term is used quite freely within the Native community. For the most part it rings true with whatever we as a people are involved in. Everything we do as a community is natural and spontaneous. We have always been able to depend on each other to come together and create something from nothing. As Native people, we often have to make a dollar out of fifteen cents. However, this is not the case with all that claim "grassroots". Native people, just like the rest of the world, have individuals that choose to benefit themselves instead of their community. There are individuals who forget that there are Elders, single moms, huge families, youth etc that are depending on us to pool our resources and create real positive social change. I warn you ... KEEP A LOOK OUT FOR GROUPS THAT ARE ASTROTURFING ... faking a grassroots movement is known as astroturfing (think fake grass - AstroTurf!). Basically, It means to mimic a grassroots organization, when in reality there are powerful lobbyists behind the movement hiding their true agenda by pretending to be individuals voicing their opinion. This hurts our people and only benefits an individual! The true test of Native people is no longer how we deal with adversity - we all deal with that. Our true test now is when you give us power. Some choose to hoard it and it dies with them. When you share power it lasts generations. SHOULD I JUST DROP OUT AND GET A JOB? I am in the tenth grade and I can't stand these teachers anymore. Should I just drop out and get a job? - Dylan C.
#2 HARSH REALITY - If you think dealing with teachers is tough ... wait until you have a boss. Most won't wanna hear about your self esteem or any of your problems. They will want results or they will find someone else. Especially when you're working minimum wage. Do you know what your boss is trying to say when they pay you minimum wage? They're saying "If I could pay you less, I would ... but it's against the law"
Dropping out is never a solution. Keep your head in the books and think about the freedom of expression that knowledge will give you. You know that weight you feel on your shoulders right now? Turn to your left and take a real close look at it. You know what it is? It's the world, bro ... and we're depending on you, we need you out here!